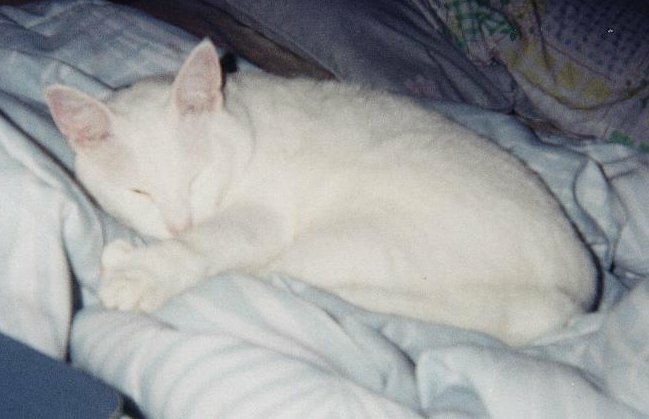 Last night I found myself sitting at my computer with tears rolling down my face because I’d just gotten a reply from my dad about what happened to my old cat that I had when I lived at home. In his reply, he told me that he had hoped I wouldn’t ask, because the truth was a real downer. My cat had become a bit senile and for health reasons, he decided to put her to sleep. She’s now buried near the gate to our old farm. Oh, who am I kidding? 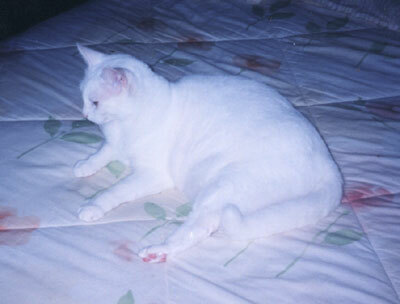 My cat was a total fatass and a violent bed hog. Not that it stopped us from loving her, though. I got her when she was just a little kitten in my junior year of high school. My boyfriend caught her at his little farm and gave her to me. Since she was all white, I named her Mochi. 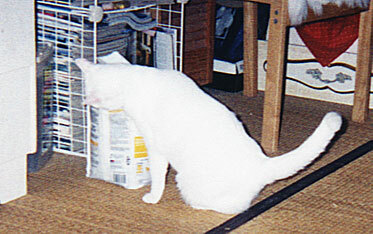 She was feisty and did the dumbest things, like getting stuck in one of those big glue mouse traps. That was not fun. She started napping on the couch like a human would. Or she’d sit down Jabba the Hut style. It was crazy! Finally the vet told us to limit her food. She was not happy. I told her one day, no more food for the day and the meanie reached out and swiped her claws across my leg and bit me! I caught her one day with her arm in the bag. 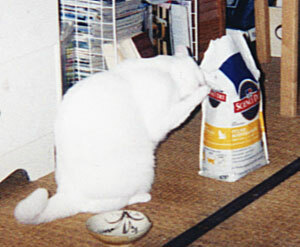 I wasn’t sure what she thought she was going to be able to get, since obviously cats don’t have fingers to grab stuff. This fact did not stop her. She spread her paw out, then clenched it to get some food stuck between her toes. She then proceeded to eat it right from her paw. Her favorite snack, hands down, was ajitsuke nori. She could be sleeping across the house and if she heard the wrapper crackle, she’d be right there ready to gobble one up. 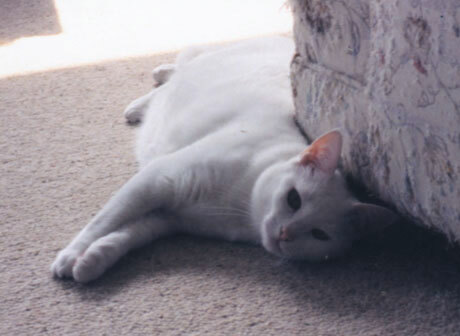 I only had her for maybe two years, but she usually slept on my bed and I carried her around like you would a baby. She’d sleep on the computer monitor or on my lap, but occasionally she’d fall off because my lap wasn’t big enough. When I moved away for college, she had a sense of what was going on and became extremely pissed. She growled at me and began clawing at me, eventually cornering me in the living room. I had to call my dad to come take her away until she calmed down. She didn’t want to sleep with me after that. 🙁 After that, I only saw her occasionally when I came home from school and hadn’t seen her for a few years when I got the news last night. Now I feel even worse for forgetting whiskers. Let’s just add some in…. There… now she looks more kitty cat-like. I made her out of rice, using only a small amount since my Hello Kitty bento box is actually quite small. I formed her with saran wrap. I really should have used a bigger mouth, but couldn’t find my larger smiley punch. 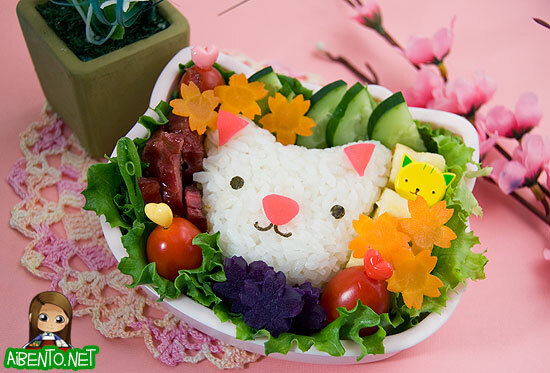 Her nose and ears are cut out of kamaboko. I got a Swissmar Borner V-Slicer Plus Mandoline for Christmas from my Secret Santa this year and I busted it out for the first time to slice the carrot super thin. It worked wonderfully and I’m totally in love with it! I also used it for the cucumber slices. I boiled the carrot for a couple of minutes and then used this deco cutter set to make the flowers. 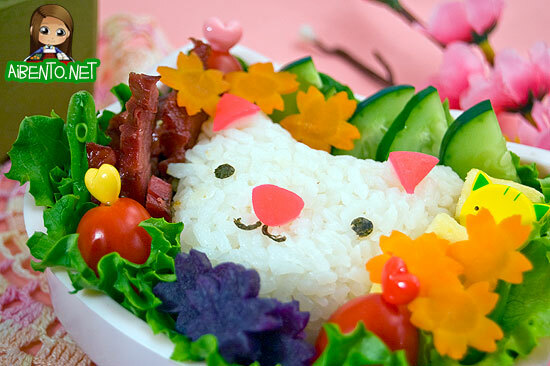 I made a small tamagoyaki roll with the leftover carrot and decorated it with a cat pick from this set. The meat on the side is fried pipi kaula, which is smoked beef from Hilo. I fried three pieces in the tamagoyaki pan after I was done with the egg. On the bottom are some sweet potato flowers. I topped everything off with the carrot flowers last. I love you, Mochi. I hope you have a big, automatic-refilling bag of cat food there with you. I won’t stop you this time.